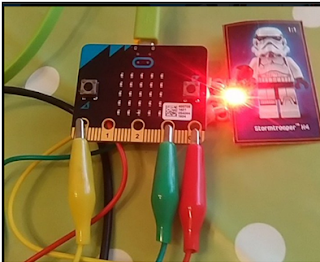 Jammy blog: Blog 2: What can "UCreate" with a Micro:bit and Neo-pixels (Moody Storm Trooper). Blog 2: What can "UCreate" with a Micro:bit and Neo-pixels (Moody Storm Trooper). This version uses the temperature of the CPU to determine which face is displayed and which colour light the neo pixel shows. There are two versions which have different ranges of the conditions of the CPU.